Next year at this time we will be back on the east coast...so this year, we are soaking up every minute of the warm weather we have been having in Southern California. Yesterday we met up with our East Coast friends for a little picnic lunch...California style. Preparing for the picnic...we made Ina Garten's corn chowder and kept it warm by heating a pizza stone and a Le Creuset and then putting the soup cups in the heated pot until we got to the beach. This kept the cups of soup piping hot until we arrived at the beach. 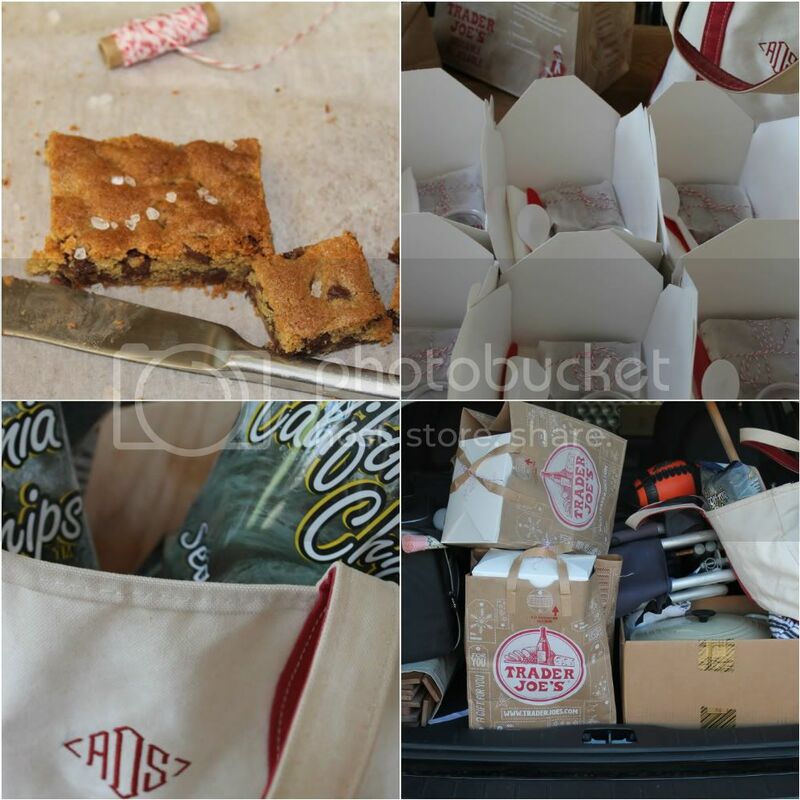 Box lunches included sandwiches, chips and chocolate chip blondies with sea salt wrapped in parchment paper. We loaded the car with beach chairs, table in a bag, cooler and footballs and had a wonderful afternoon enjoying 75º temperatures. I'm so sad you'll be leaving So. Cal. We must try to connect before you leave! Enjoy the warm weather! The beach is beautiful! We will be heading out your way (hopefully) in the spring to visit our good friends in Long Beach/Del Mar and family in San Diego. We are so excited. The picnic sounds delicious! I love anything by Ina Garten. This is my kind of picnic! Everything looks delicious! What a great tip on keeping soup warm. Hope you had a great Christmas! Was this just for a family picnic? What a great idea. Oh wow, the envy is dripping from me just now. I love that red and white string that you have, I can't find anything like that here. Oh, that sounds PERFECT!!! I love the beach and I love picnics. What a fabulous combination -- and the menu sounds scrumptious too. Food tastes so much better by the ocean. You definitely have to check out the book that you got Madeline - I think it will be a great help next time you are in NYC. I can't wait to see some of the places the author talks about. I hope you had a wonderful Christmas. It has been hard to keep up with the blogging this week don't you think?! Looks delicious and of course beautiful as well. We will be on the East Coast by January next year, hopefully before then but for sure within the year. When do you leave? What a fun outing, and the food looks delicious! I hope you had a wonderful Christmas. Best wishes for a very Happy New Year! Saw your blog when I was looking at LaDitta Design blog designs and had to stop over! Happy to be your newest follower. This picnic looks amazing and makes me so excited to be heading to Florida next week! What a perfect way to spend the day...warm weather will not be coming to Chicago anytime soon. Are you moving? omg are you moving back east!? that is SO incredibly exciting if you are!! 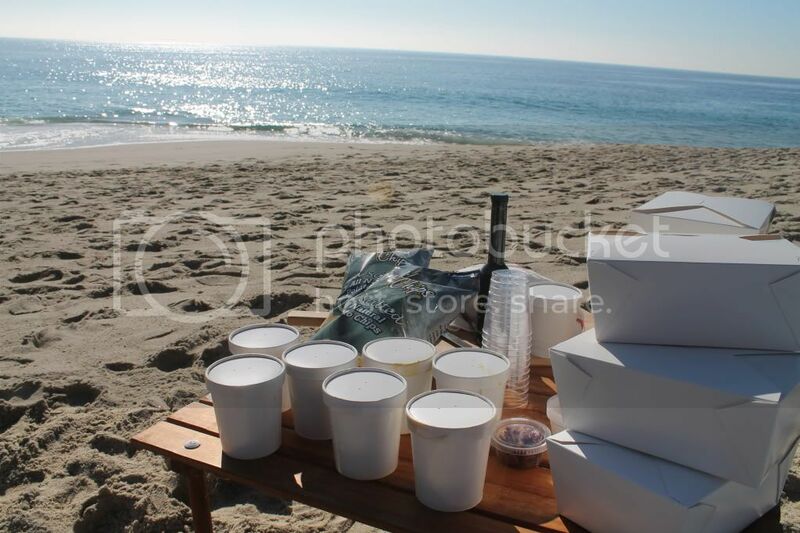 what a beautiful beach picnic. such a treat for your east coast friends i'm sure!! happy new year to you and your family!!!!! Annie, you really know how to live in STYLE!!! Great idea for keeping the soup warm. I have used that recipe before...delish. Still in Mammoth and praying for more snow! Love this! I just ordered that red bag!